WPX Energy (NYSE:WPX) reported $164 million net income in 2014. Photo by Edward DeCroce. Courtesy of WPX. WPX’s 2014 financial highlights include $190 million higher oil sales, $106 million higher natural gas sales, and a 68 percent increase in net cash provided by operating activities vs. 2013 results. During the fourth quarter, oil and natural gas liquids (NGL) sales accounted for 50 percent of WPX’s product revenues and 28 percent of production volumes. Diversifying the company’s historically gas-weighted production is part of WPX’s long-term, multi-year strategy. Oil volumes were 32,300 barrels per day in fourth-quarter 2014, up 71 percent over a year ago and 25 percent higher than the sequential quarter. During the year, WPX also entered into six agreements with an aggregate value of more than $1 billion to narrow the company’s business focus, increase scalability of core assets, bring value forward and further strengthen its balance sheet. Operationally, WPX increased proved oil reserves by 28 million barrels in 2014 and achieved a 40 percent improvement in drilling times on Gallup oil wells in the San Juan Basin. “We executed extremely well last year, delivered on our word and took timely action to start the transformation of the company,” said Rick Muncrief, president and chief executive officer. “We divested non-core operations, sharpened our geographic focus, boosted oil production, increased cash flow, put a new credit facility in place and launched a long-term strategy to expand margins and profitably grow the company. “Today, we are well positioned for the challenges and opportunities presented by lower commodity prices. Being successful in this environment means staying proactive and opportunistic. “We will continue to enhance our portfolio, organization, cost structure and processes,” Muncrief added. WPX reported unaudited net income attributable to WPX Energy of $164 million for full-year 2014, or income of $0.80 per share on a diluted basis, compared with a net loss of $1,185 million, or a loss of $5.91 per share, in 2013. Improved results reflect the benefit of higher oil revenues, higher gas management revenues, higher oil production, higher weighted average gross sales prices for natural gas and natural gas liquids, and the absence of approximately $1.2 billion in non-cash impairments that occurred in 2013. Net income from continuing operations attributable to WPX Energy was $129 million in 2014, or income of $0.62 per share on a diluted basis, compared with a net loss of $1,092 million, or a loss of $5.45 per share, in 2013. A 36 percent increase in oil revenues, a 12 percent increase in natural gas revenues, net gains on derivatives not designated as hedges and a $27 million improvement in certain operating expenses were partially offset by a 10 percent decline in natural gas liquids revenues, a $196 million loss on the sale of working interests in the Piceance Basin and $149 million in non-cash impairment charges. Excluding unrealized mark-to-market gains (losses), impairments to producing properties and the costs of acquired unproved reserves, exploratory-related impairments, the loss on the sale of working interests and $36 million in other non-recurring fees, WPX had adjusted income from continuing operations of $24 million, or income of $0.12 per share on a diluted basis, for full-year 2014, compared with an adjusted loss from continuing operations of $263 million, or a loss of $1.31 per share, for full-year 2013. A reconciliation accompanies this press release. The weighted average gross sales price – prior to revenue deductions – for natural gas was $3.94 per Mcf for full-year 2014 compared with $3.34 per Mcf in 2013. The weighted average gross sales price – prior to revenue deductions – for oil was $78.80 per barrel for full-year 2014 compared with $91.40 per barrel in 2013. The weighted average gross sales price – prior to revenue deductions – for NGL was $42.79 per barrel for full-year 2014 compared with $40.14 per barrel in 2013. WPX reported unaudited net income attributable to WPX Energy of $219 million for fourth-quarter 2014, or income of $1.06 per share on a diluted basis, compared with a net loss of $973 million, or a loss of $4.85 per share, in fourth-quarter 2013. Net income from continuing operations attributable to WPX Energy was $227 million in fourth-quarter 2014, or income of $1.10 per share on a diluted basis, vs. a loss of $878 million, or a loss of $4.37 per share, for fourth-quarter 2013. Fourth-quarter 2014 results include the benefit of $453 million in unrealized mark-to-market gains due to decreases in forward oil and natural gas prices, coupled with a $34 million increase in oil revenues and higher weighted average gross sales prices for natural gas. Fourth-quarter 2013 included non-cash impairments of approximately $1.2 billion. Excluding unrealized mark-to-market gains (losses), impairments to producing properties and the costs of acquired unproved reserves, exploratory-related impairments and $20 million in the buyout of a storage commitment and early rig release expenses, WPX had adjusted income from continuing operations of $7 million, or income of $0.03 per share on a diluted basis, for fourth-quarter 2014, compared with an adjusted loss from continuing operations of $73 million, or a loss of $0.36 per share, for the same period in 2013. A reconciliation accompanies this press release. The weighted average gross sales price – prior to revenue deductions – for natural gas was $3.55 per Mcf in fourth-quarter 2014 compared with $3.28 per Mcf for the same period in 2013. The weighted average gross sales price – prior to revenue deductions – for oil was $61.09 per barrel in fourth-quarter 2014 compared with $87.76 per barrel for the same period in 2013. The weighted average gross sales price – prior to revenue deductions – for NGL was $33.68 per barrel in fourth-quarter 2014 compared with $43.32 per barrel for the same period in 2013. WPX’s adjusted EBITDAX (a non-GAAP measure) for full-year 2014 was $967 million, an increase of 49 percent compared with $648 million for the same measure in 2013. For fourth-quarter 2014, WPX had adjusted EBITDAX of $238 million, an increase of 53 percent compared with $156 million for fourth-quarter 2013. The primary factors contributing to the increase in 2014 adjusted EBITDAX are increased domestic oil volumes and the corresponding increase in domestic oil revenues, as well as higher net realized average prices for natural gas. EBITDAX represents earnings before interest expense, income taxes, depreciation, depletion and amortization and exploration expenses. Adjusted EBITDAX includes adjustments for net (gain) loss on derivatives not designated as hedges, loss on the sale of working interests in the Piceance Basin, net cash received (paid) on settlement of derivatives not designated as hedges, impairments and discontinued operations. WPX believes these non-GAAP measures provide useful information regarding its ability to meet future debt service, capital expenditures and working capital requirements. WPX’s overall production for full-year 2014 was 170.5 MBoe/d, or 1,023 MMcfe/d. Oil production grew 56 percent vs. the prior year. Oil and NGL volumes accounted for 25 percent of WPX’s full-year 2014 production and 28 percent of WPX’s fourth-quarter 2014 production of 171.9 Mboe/d, or 1,032 MMcfe/d. Powder River and International volumes are excluded and reported as discontinued operations. Oil production climbed substantially in fourth-quarter 2014 to 32,300 barrels per day. This represents a 71 percent increase over the same period a year ago, as well as a 25 percent sequential-quarter increase over third-quarter 2014 production of 25,800 barrels per day. Oil production accounted for 19 percent of WPX’s overall fourth-quarter production, up from 11 percent in the same period a year ago. Higher volumes from the company’s oil development in the Williston Basin and San Juan Basin’s Gallup oil play are driving more balance in WPX’s production profile. Williston oil volumes grew 48 percent in 2014, while San Juan oil volumes grew 388 percent. Natural gas production from continuing operations decreased 5 percent in 2014 to 768 MMcf/d from 811 MMcf/d a year ago. Production figures for 2014, specifically natural gas and NGL, reflect the absence of volumes due to the sale of working interests in certain Piceance Basin wells in 2014. After adjusting the volumes in previous quarters for the impact of the sale of working interests in the Piceance wells, WPX’s overall equivalent volumes would have increased 4 percent for full-year 2014 and 10 percent in fourth-quarter 2014 vs. the same periods in 2013. NGL production volumes were impacted throughout 2014 by low ethane recovery rates. The ethane recovery rate was 14 percent in fourth-quarter 2014 and 22 percent for the full year. NGL production averaged 17,100 barrels per day for the year, and 15,900 barrels per day in the fourth quarter. WPX’s operating expenses – excluding exploration expense – were approximately $27 million lower for full-year 2014 than 2013 and approximately 4 percent lower in fourth-quarter 2014 than fourth-quarter 2013. WPX’s lease and facility operating expenses for full-year 2014 were $244 million vs. $227 million in 2013. The increase primarily relates to increased oil production in the Williston and San Juan basins. Gathering, processing and transportation charges decreased 6 percent in 2014 to $328 million vs. $350 million in 2013. The decrease primarily is attributable to lower natural gas and NGL volumes and approximately $5 million recognized during 2014 related to a tariff rate refund received in prior years which is no longer under appeal by the carrier. Taxes other than income for operations in 2014 were $126 million vs. $102 million in 2013, driven by increased crude oil volumes and higher natural gas prices. Depreciation, depletion and amortization expense was $810 million in 2014, down approximately 6 percent compared with $858 million in 2013. The $48 million decrease is due to lower natural gas production volumes and the impact of impairments taken in 2013 in the Appalachian Basin. General and administrative expenses were relatively flat year over year at $271 million in 2014 vs. $269 million in 2013. This includes $10 million in 2014 related to a voluntary early exit program. Notably, G&A expenses dropped more than 11 percent in the fourth quarter of 2014 to $63 million vs. $71 million in the same period a year ago. Exploration expense was $173 million in 2014, compared with $423 million in 2013. The prior-year exploration expense included a $317 million impairment to fair value of leasehold in the Appalachian Basin. Full-year 2014 includes a $67 million impairment of the carrying cost on producing and exploration wells in excess of discounted cash flows of an exploratory play. Net cash provided by operating activities for full-year 2014 was approximately $1.07 billion, including $291 million in the fourth quarter. Net cash for 2014 increased 68 percent vs. $636 million in 2013. At Dec. 31, 2014, WPX had approximately $41 million in unrestricted domestic cash and cash equivalents. The company’s total domestic liquidity at the end of 2014 was approximately $1.3 billion. WPX executed a new five-year $1.5 billion senior unsecured credit facility in the fourth quarter. Subsequent to year-end, WPX generated another $568 million in cash through completing the sales of its international interests in Argentina and Colombia and its natural gas operations in northeast Pennsylvania’s Marcellus Shale. WPX made $1.8 billion of capital investments in 2014, including approximately $1.4 billion for drilling and completion activity. During 2014, WPX participated in 479 gross (375 net) wells, including 353 gross (334 net) operated wells in the Williston, San Juan and Piceance basins. Highlights for the company’s operated wells in its three core areas are provided below. The balance of gross (net) wells is accounted for in non-operated interests, as well as WPX’s own properties in other areas such as the Appalachian Basin. In the Williston Basin, WPX completed 53 gross (45 net) oil wells in 2014, including 14 gross (11 net) in the fourth quarter. This compares with 49 gross (36 net) for full-year 2013. WPX set a production high in the Williston during the fourth quarter, averaging more than 25,000 barrels of oil per day for the month of November. In the San Juan Basin’s Gallup oil play, WPX completed 47 gross (44 net) oil wells in 2014, including 21 gross (21 net) in the fourth quarter. This compares with 13 gross (13 net) for full-year 2013. WPX nearly doubled its Gallup acreage position in 2014 and now owns or controls approximately 85,000 net acres in the play’s oil window. WPX also reduced its spud-to-rig release time on Gallup wells by 40 percent to 13.5 days in 2014 vs. an average of 22.3 days in 2013. WPX’s best drilling time on a Gallup well is 8.9 days, set this year. In the Piceance Basin, WPX completed 253 gross (245 net) natural gas wells in 2014, including 68 gross (65 net) in the fourth quarter. This compares with 250 gross (237 net) for full-year 2013. WPX continues to delineate its Niobrara Shale natural gas discovery in the Piceance, spudding five more exploratory test wells in 2014 including its first two-well horizontal Niobrara pad. WPX’s total domestic proved reserves at Dec. 31, 2014, were 727 million barrels of oil equivalent, or 4.36 trillion cubic feet equivalent. Oil reserves increased 27 percent over the prior year to 131 million barrels. WPX replaced its oil production at a rate of 421 percent, excluding divestitures. Year-end 2014 proved reserves reflect 72 percent natural gas, 18 percent crude oil and 10 percent natural gas liquids, compared with 76 percent natural gas, 13 percent crude oil and 11 percent NGL at year-end 2013. Overall proved reserves declined 8 percent vs. 2013 primarily from divestitures, the impact of the SEC five-year rule due to a reduction in planned capital spending, and continued ethane rejection. Eighty-eight percent of WPX’s year-end 2014 proved reserves estimates were audited by Netherland, Sewell & Associates, Inc. Their judgment determined that the company’s estimates are, in the aggregate, reasonable and have been prepared in accordance with the Standards Pertaining to the Estimating and Auditing of Oil and Gas Reserves Information promulgated by the Society of Petroleum Engineers (SPE standards). Proved reserves are estimated quantities that geological and engineering data demonstrate with reasonable certainty to be recoverable in the future from known reservoirs under the Securities and Exchange Commission pricing provisions, existing operating methods and government regulations. On a proved, probable and possible (3P) basis, WPX has approximately 14,800 remaining undrilled locations across its acreage and interests. WPX’s 3P reserves at year-end 2014 were 2.76 billion Boe. 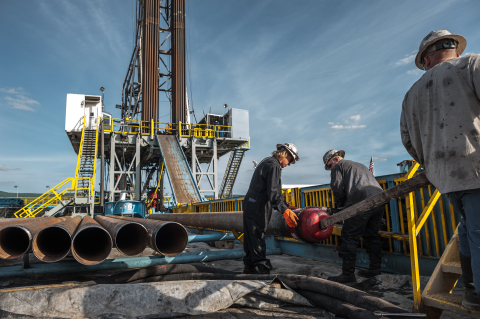 Subsequent to the end of 2014, WPX completed the sale of its international interests for approximately $294 million and the sale of its northeast Pennsylvania Marcellus Shale operations and a transportation contract for approximately $300 million. Additionally, WPX continues to negotiate the divestiture of its Powder River Basin operations. The original sales agreement was scheduled to terminate Feb. 13, but both parties agreed to extend the timetable. If the agreement does not successfully close in March, WPX has the option to terminate the transaction. WPX management will discuss its 2014 results and 2015 outlook during a webcast starting at 10 a.m. Eastern on Thursday, Feb. 26. Participants can access the audio and the slides for the event via the homepage at www.wpxenergy.com. A limited number of phone lines also will be available at 877-201-0168. International callers should dial 647-788-4901. The conference identification code for both phone numbers is 65130042. A replay of the webcast will be available on WPX’s website for one year following the event. WPX plans to file its 2014 Form 10-K with the Securities and Exchange Commission this week. Once filed, the document will be available on both the SEC and WPX websites. (1) Excludes our Powder River Basin and international operations, which were classified as discontinued operations. (2) Oil and natural gas liquids were converted to MMcfe using the ratio of one barrel of oil, condensate or natural gas liquids to six thousand cubic feet of natural gas. (3) MMcfe is converted to MBoe using the ratio of one barrel to six thousand cubic feet of natural gas. (1) These items are presented net of amounts attributable to noncontrolling interests. (a) 2014 includes $196 million loss on the sale of working interests in the Piceance Basin, 2013 includes a $36 million gain on sale of Powder River Basin deep rights leasehold and 2012 includes a $38 million gain on the sale of our holdings in Barnett Shale and Arkoma Basin. (c) Amounts include cash associated with our international operations which represent the difference between amounts reported as cash on the Balance Sheets.